At Zacks Eye Clinic in central London W1 we advise that regular eye sight tests are a vital part of any health care program. Eye sight tests are essential to ensure normal visual development in children and for the early detection of conditions affecting the eyes and general health. 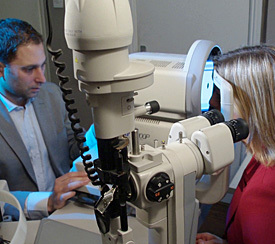 Every patient is given a very thorough eye sight test, including scans of the eyes and retinal photographs which takes at least half an hour. Further appointments may be required for additional scans or specialist examinations. This was the most thorough and best eye examination I have ever had and the advice given and the resultant glasses were remarkable. At the first appointment, we aim to gather as much information as possible regarding ocular history, general health and family history. Details of previous prescriptions for glasses, contact lenses and medication are also extremely valuable along with information regarding lifestyle and specific optical requirements. After the eye examination advice is given on the most suitable visual correction. Occasionally a second appointment is required for further tests or specialist examinations and if necessary we will liase with a patient’s doctors and specialists.